In addition to the environmental impacts of a turbine, there are concerns with its interaction with the fishing industry. The presence of turbines close to shore alters the ability of fisherman to operate in that vicinity. It is imperative to consider fish-turbine interactions in order to maintain the proper functioning of the turbines and the long term stability of the marine populations. 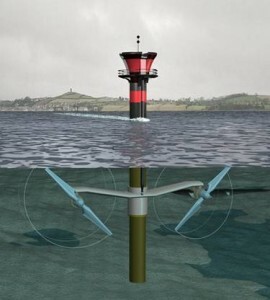 If full grown fish avoid the turbines because of disruptive noise or EM fields, then fishermen would have no interest in the area; if the base of the turbine becomes an artificial reef where fish congregate for food, breeding, etc., then the fish require protection from overfishing (Fayram, 2007). The restriction of fishing will aid the fishermen in the long term as they will be able to harvest more mature fish. The presence of underwater turbines should not drastically decrease the area available for productive fishing. 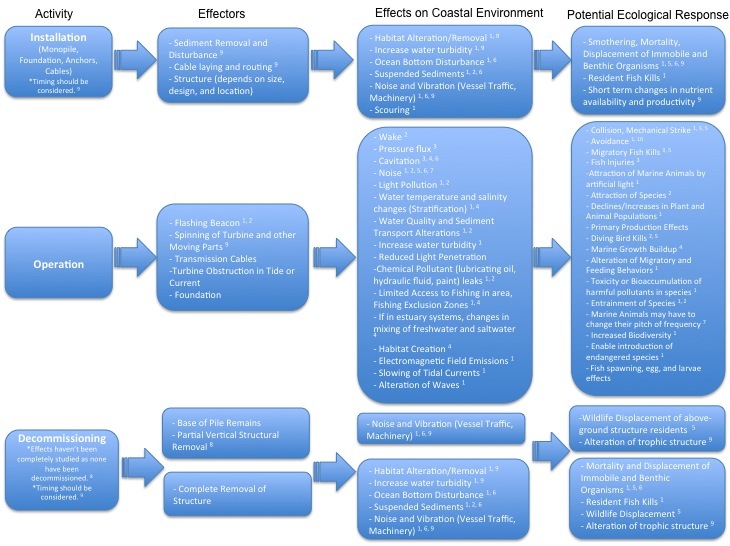 Please see a conceptual diagram to understand more of the environmental impacts. There is a potential for artificial reefs on the turbine foundations and on the scour protection. Fayram, Andrew H., and de Risi Arturo. “The potential compatibility of offshore wind power and fisheries: An example using bluefin tuna in the Adriatic Sea.” Ocean and Coastal Management 50. (2007): 597-605. Web. 27 May 2010.